Community groups say building a trauma in Chicago’s South Side would save lives. 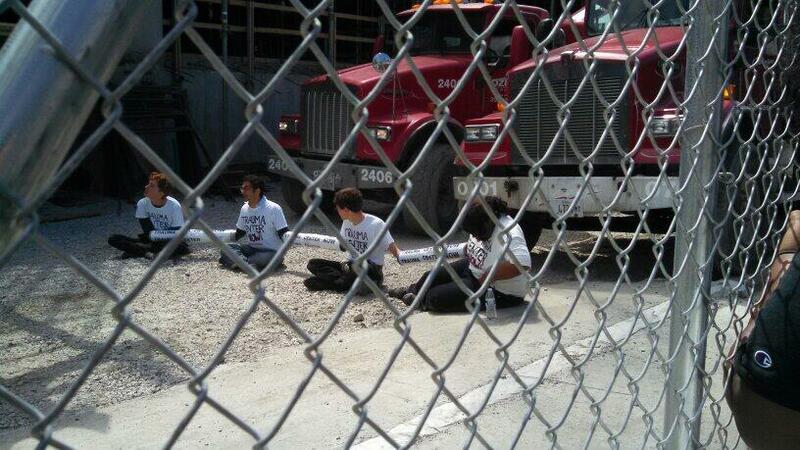 University of Chicago Police forcibly removed four protesters blocking the entrance of a hospital construction site Monday morning, the latest clash between university officials and community members asking for an adult trauma center in the city’s South Side. There are no adult trauma centers in the Chicago’s South Side, where heavy gun violence has struck a toll on the community, especially black youth. The University of Chicago Medical Center (UCMC) treats trauma victims under sixteen, but closed such services to older patients in 1988. The nearest level one trauma centers from South Side are at Northwestern Medical Center downtown and Advocate Christ Medical Center in the Oak Lawn suburb, both about ten miles away. Monday’s act of civil disobedience kicked off a week of action, organized by a coalition of community groups demanding that UCMC reopen its adult trauma center. The week will culminate on Friday with a march to the home of university president Robert Zimmer. The Trauma Center Coalition timed its week of action to take place as University of Chicago officials prepare a bid to host Barack Obama’s presidential library. University administrators released a glowing study Monday, projecting that opening the Obama library in the South Side, the president’s hometown, would create 2,000 permanent jobs for Chicago. But activists say U of C should prioritize correcting the dearth of trauma centers in the area over its bid for the next presidential library. “President Obama has tried to stop gun violence and create opportunities for young black men, meanwhile the University of Chicago sits in the center of a gun violence epidemic on the South Side and has shown that it does not value black life, by refusing to open a trauma center and save the lives of the young black men dying at their door,” said Victoria Crider, a high school senior and trauma center activist, in a statement. Research shows that having a trauma center nearby can save lives in a community. A Northwestern University study identified South Side Chicago as a “relative trauma desert in Chicago’s regional trauma system that is associated with increased gunshot wound mortality.” According to a WBEZ investigation, patients from the area face a longer ambulance run time, on average 50 percent longer, than other city residents. Young activists began pushing to reopen the trauma center in 2010, just months after a drive by shooting claimed the life of 18-year-old Damian Turner. Though Turner was gunned down four blocks from UCMC, an ambulance had to take him to the nearest trauma center, more than nine miles away at Northwestern Memorial Hospital downtown. Turner, a co-founder of the activist group Fearless Leading by the Youth, died at Northwestern ninety minutes after getting shot. “We are protesting this week because its unfair for this community not to have a trauma center, its heartless,” said Sheila Rush, Turner’s mother, in a statement. Hospital administrators say opening an adult trauma center would be too expensive, suggesting that it would have to come at the cost of other services, such as UCMC’s neonatal intensive care unit and its burn unit. “Developing a Level 1 trauma center would be a massive undertaking, requiring significant resources and support, as well as a complex decision-making process involving the city, the state, and Chicago’s trauma network,” UCMC said in a statement. Activists don’t buy that claim, pointing to the hospital’s $782 million endowment, as well as a $4.5 billion capital campaign announced this week by President Zimmer.